Photo taken at Twin Lakes State Park, Santa Cruz County © 2007 Dylan Neubauer. Coastal prairie on marine terraces flanking the northern Monterey Bay (and, formerly, around the outer San Francisco Bay); 10-220 m.
Aromatic, densely glanduar, annual herb from 1–5 dm tall, larger plants branched, stem notably stalked-glandular; leaves basal-rosetted, generally withered before flower, lower leaves minutely serrate, cauline leaves progressively becoming linear, bract-like, axillary leaf clusters tipped by tack-shaped yellow glands exuding “tar”-like compounds; flower heads 1, in tight groups, or in spike-like clusters of tight groups, involucres ± spheric, peduncle bracts pit-gland-tipped; phyllaries each with ± 25 pit-gland-tipped outgrowths and minutely sessile- or stalked-glandular; ray flowers 8–16, rays 4–6.5 mm long, corolla yellow; disk flowers 40–90, paleae subtending all or most; anthers dark (Baldwin 2013). Superficially similar to much more common coast tarweed (Deinandra corymbosa ssp. corymbosa), which has deeply lobed leaves, lacks pit-glands on peduncle bracts and paleae. City of Santa Cruz Arana Gulch Greenbelt (Santa Cruz County); Elkhorn Slough Foundation’s Porter Ranch (Monterey County). Extant only in central California in Monterey and Santa Cruz counties. 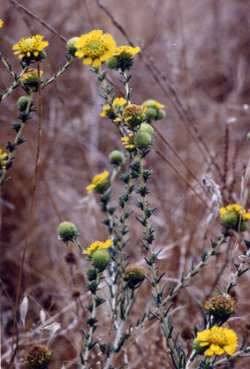 Extirpated from Alameda, Marin, and Sonoma counties; found in Contra Costa County only in introduced populations on East Bay Regional Parks property. 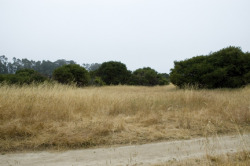 Most coastal prairie habitat in central California has been irrevocably altered or destroyed. Historically, the destruction of Santa Cruz tarplant populations was due to development (USFWS 2014). The last San Francisco Bay area population was extirpated to build a mall in 1993. Plants persist there only as artificially seeded occurrences in Wildcat Canyon Regional Park in Contra Costa County (USFWS 2014). Less than half of the 22 locations have been able to support persistent populations, however, and in recent years only four populations have supported plants (USFWS 2014). 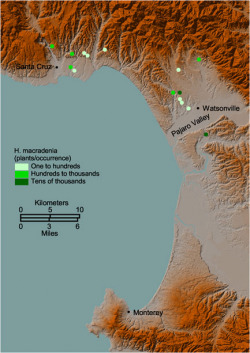 Only one population occurs in northern Monterey County (USFWS 2014). Since the 1970s, several populations have become extirpated in Santa Cruz County (Palmer 1987) and most others have declined significantly. Intensive management is required to conserve this species as small populations are particularly vulnerable to local extinction. The species is known to tolerate grazing and to decline in pastures where grazing is discontinued, allowing weedy exotics to create a tall overstory that inhibits growth of the lower-statured tarplant and other low herbs (Hayes and Holl 2003). Several populations have had high numbers when grazed and suffered drastic declines after the cessation of grazing. One of the largest populations at the Watsonville Airport has a mowing regime that simulates grazing, has supported between 400,000 to as many as 28 million plants, fluctuating in relation to rainfall (USFWS 2014). Despite the numbers, the habitat is fragmented and heavily altered (USFWS 2014) and the site is vulnerable as improvements are planned for the Airport (USFWS 2014). Baldwin, B. G. 2013. 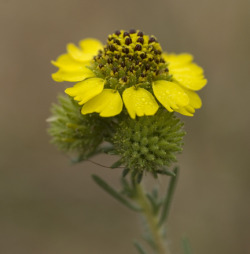 Holocarpha, in Jepson Flora Project (eds.). Jepson eFlora, http://ucjeps.berkeley.edu/cgi-bin/get_IJM.pl?tid=3558 [accessed 17 February 2015]. Havlik, N. 1987. The Santa Cruz tarplant relocation project, pp. 421–425 in T. S. Elias, ed., Conservation and Management of Rare and Endangered Plants. California Native Plant Society Press, Sacramento, CA. Hayes, G. and K. D. Holl. 2003. Cattle grazing impacts on annual forbs and vegetation composition of mesic grasslands in California. Conservation Biology 17(6):1694–1702. Palmer, R. 1987. Evolutionary relationships of Holocarpha macradenia, pp. 295–304 in T. S. Elias, ed., Conservation and Management of Rare and Endangered Plants, California Native Plant Society Press, Sacramento, CA. U.S. Fish and Wildlife Service. 2014. Holocarpha macradenia (Santa Cruz tarplant) 5-year review: summary and evaluation. Ventura Fish and Wildlife Office, Ventura, CA. http://ecos.fws.gov/docs/five_year_review/doc4365.pdf [accessed 17 February 2015].